Capitol Dentistry, located in the bustling neighbourhood of Yonge and Eglinton, provides a wide range of dental services to patients living in North Toronto. Read about all of our services and book an appointment with one of our dentists. Capitol Dentistry is your one-stop-shop for dental services at Yonge-Eglinton in Toronto. If you are looking for general dentistry, orthodontics, oral surgery, periodontics or sedation, we have the team to provide you with the oral care you're looking for. Just Moved? Here are some Frequently Asked Questions when looking for a new dentist. We have an on-site periodontist to help with early detection of Periodontitis, Gingivitis and other gum disease health issues that can cause sore gums. We recommend visiting the dentist every six months for a checkup. It's also important to maintain your oral health in between visits - including brushing twice and flossing once daily. Discover Your Smile at Capitol Dentistry. Book an Appointment. 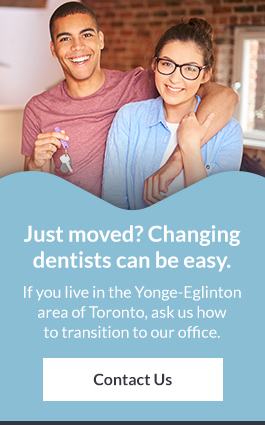 If you live or work in the Yonge-Eglinton area, book an appointment today. Our team looks forward to meeting you.